The whole point of a wedding invitation is to ensure that your guests know about your happy occasion and that they have all the information they need to make the most of the event. This means that you need to provide all of the important facts, such as date, time and location of the happy event. However, sometimes just providing facts isn’t enough; you need to provide people with a sense of what the event is going to be like. Wedding celebrations can come in all shapes and sizes and if you want to make sure your guests know that they are coming to a party where they should expect to have a great time, you should provide this information on the invitation. This is where the Dancing Shoes wedding invitation from Paper Themes provides everything your guests need to know. With a touch of sparkle and the stated instruction of “put on your dancing shows and join us at our wedding”, your guests will know that this is a celebration and an excuse to have a lot of fun. 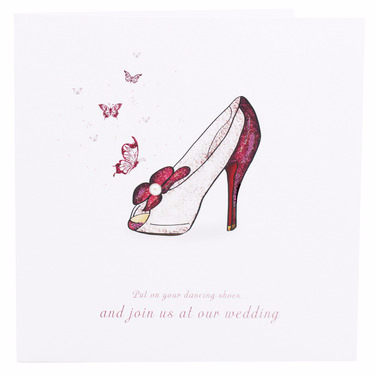 The invitation itself features a bridal shoe that has been embellished with a pearl at the top and fluttering butterflies on the card. The invitation manages to combine the sense of love, romance and fun, which is exactly what many couples are looking for on their special day. The invitation comes with three separate inserts, which means that all of the relevant information can be included and there is an opportunity for guests to RSVP. With matching stationery on offer, if you want to have fun in everything you do before and after your wedding, this is the invitation and matching stationery package that is right for you. Tags: Dancing, Pearl, Wedding Shoes.